A synergy between physical and numerical modeling has always been MARINTEK’s strategy in its research and commercial services. One of the important areas in our activity is the design support and performance prediction for deep-sea vessels of different types. 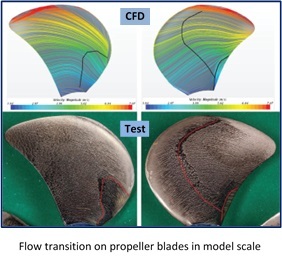 Computational Fluid Dynamics (CFD) is a powerful numerical tool that allows the researcher to obtain deeper insight into the complex physical mechanisms behind the results of the model tests and sea trials. The ship speed and power prognosis is routinely done based on the results of model tests. Therefore, an adequate account for the effect of Reynolds number, otherwise known as “scale effect” is crucial for the accuracy of performance prediction. The scale effect is found on hull resistance, propulsor open water characteristics and hull-propeller interaction, thus affecting the results of all the three stages of a standard test program. Through systematic CFD investigations performed under variable scale factor we are able to quantify the magnitudes of scale effect arising from the different components of the system ship-propulsor. Such investigations represent a considerable challenge due to the complexity of numerical setup and the great extent of the target case matrix necessary to cover a range of scales and operating conditions. 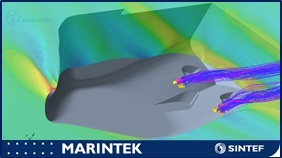 STAR-CCM+ is the main CFD tool employed by MARINTEK in our propulsion simulations. 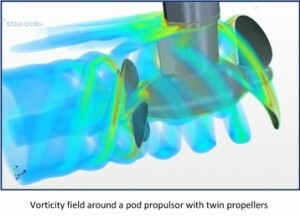 A hybrid meshing approach using hexahedral trimmed meshes in the main fluid domain, and polyhedral meshes in propeller regions, is accurate and cost-effective in the problems involving ship hull, rotating propellers and free surface. The parts-based meshing concept is particularly robust when one has to run simulations over a large case matrix, varying input geometries and scale, but keeping the desired setup template. The cloud computing resources by Gompute are of great help when it comes to extensive CFD investigations dealing with heavy meshes such as found in self-propulsion calculations. The capacity of the Gompute cluster and booking scheme can be customized conveniently to meet the needs of your project. When one is armed with such CFD tool as STAR-CCM+ and has the possibility to utilize its power, which needs good computational facilities such as those of Gompute, one can focus on science. In this study, we were able to get a much better understanding of physical phenomena, underlying scale effect on modern marine propulsors and vessels equipped with such propulsors. These phenomena include, but not limited to, laminar-to-turbulent transition in model scale, and complex interaction mechanisms between the propulsor components. The results are used to improve the accuracy of our performance prediction procedures, which constitute the basis for one of our mainstream services.